Shopping for a new Honda Fit? If value is your beacon in the murky waters of economy cars that aren’t crossovers, stick with the base Fit LX and pay extra for the safety bundle. The 2018 Honda Fit spaces out when it comes to economy-car goodness. First-time new car buyers would do well to consider the 2018 Honda Fit hatchback. The Fit offers a versatile interior, good gas mileage, an entertaining drive, and good safety equipment. Honda sells a Fit LX, a Fit Sport, a Fit EX, and a Fit EX-L. There’s something here for anyone who might spend under $20,000, but the Fit LX is an exceptional bargain. The Fit’s a tall hatchback, nearly as tall as the HR-V crossover Honda spins from some of the same hardware. Yet the Fit has a minivan-like shape that makes the most of its footprint. A crease here, a fold there, the Fit’s shape does nothing foul or exceedingly fair. The cabin seems a bit busy, but functions well enough. Our biggest complaint is the durable stuff Honda uses to cover the dash and doors. 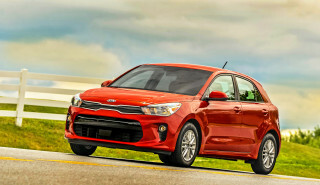 Power for the Fit comes in the form of a 130-horsepower 4-cylinder, which will hit 60 mph in about 10 seconds if you’re firm on the throttle. You’ll know when it’s happening; the inline-4 makes plenty of noise when it’s at full crank. Honda sells a lovely 6-speed manual to Fit buyers, but most of you will end up with a CVT because gas mileage is higher, operation is forget-about-it smooth, and on some models, it comes with shift paddles that in econoboxes like this, act more like fidget spinners than speed controls. The Fit’s more about fuel economy; numbers have been recalculated downward this year, but 33 mpg combined ratings still apply to the most popular versions. The Fit's suspension absorbs bumps better than before, and steering gets retuned this year. The current Fit doesn’t quite have the handling magic of the first generation car, but it’s a pleasant way to weave through traffic. Seating and flexibility are the Fit’s claim to fame. The seats are unspectacular, but they’re surrounded by vast interior space, with excellent head room. Honda’s flip-folding second-row seats can recline, can fold up to open up a tall cargo space behind the front seats, and can fold down so the Fit can carry ladders and surfboards and the like. The Fit hasn’t scored perfect grades on the IIHS crash-test regimen, but Honda now makes forward-collision warnings and automatic emergency braking standard on nearly every model. Other standard features include power features, Bluetooth audio streaming, a USB port, and air conditioning. Top models get navigation and leather and a side-view camera, but the Fit LX is our pick for the most rational buy of the lineup. The Honda Fit doesn’t get many second looks. 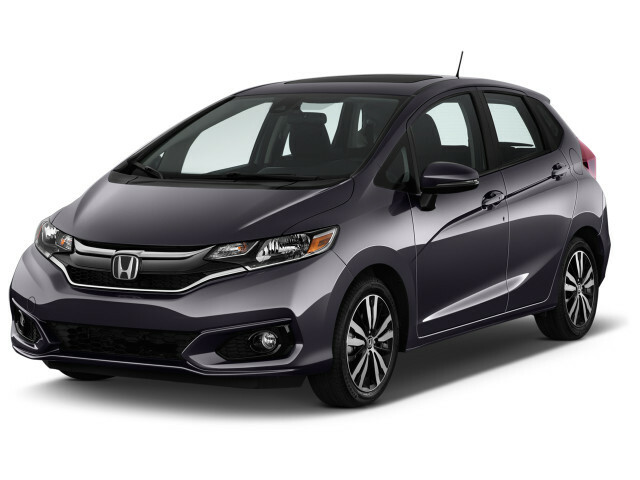 An attractive and polished hatchback, the Honda Fit has a cohesive look to its sheet metal that scales down a minivan outline to a city-friendly size. It manages to disguise its very tall profile. The mini-minivan silhouette of the Fit bears some details that cut the shape down to size. There’s a deep crease stamped low on its sides, which makes it appear longer than it really is. The windshield has a steep rake, and the hood is short and stubby, but the Fit still looks good on its 15-inch base or 16-inch upgrade wheels. Big taillights run down from the top of its hatch into the bumpers in a way that Volvo wouldn’t find unfamiliar. If it were our call, we’d paint in body color the matte-chrome bar incised across the Fit’s rear. The relative restraint that Honda's designers kept to for its exterior was mostly thrown away inside, where things are a little too ambitious. An ultra-busy instrument panel is loaded with shapes, pieces, trims, bezels, and surfaces that can feel a little haphazard. While nothing looks and feels especially low-rent, the Fit pales in comparison to the simpler look offered by the Honda HR-V, a small crossover derived from the Fit. The Fit is zippy around town, but the sportiness from earlier versions is gone now. Power in the Fit comes from a 1.5-liter inline-4. 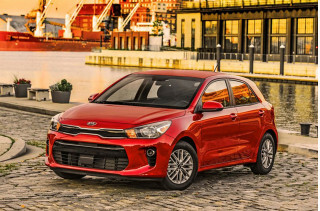 With 130 horsepower and 114 pound-feet of torque, the 4-cylinder has direct injection that helps it post fuel economy in the 30s, on the EPA combined scale. It’s unremarkable in other ways, save for the gruff engine noises that have worked their way into the cabin in recent model years. 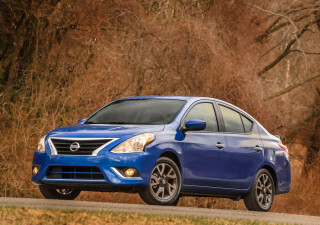 Power starts to taper off above 4,000 rpm, right where the available CVT finds its sweet spot. A 6-speed manual is the standard gearbox. It’s precise, and has the usual light Honda shift action. It’s our choice, but most of you will opt for the continuously variable transmission (CVT). The Fit's CVT modulates its gear ratios well, without any shift shock or surge, and it moves quickly to change its ratios. It’s more transparent in its action than some CVTs, but like those transmissions, it’s naturally inclined to sap some of the liveliness that might be found otherwise. On top trims, the CVT gets shift paddles and a Sport mode for quicker throttle response; neither is transformational. The Fit doesn’t respond with the eager verve it did in its first generation, but it’s still one of the better-handling econoboxes. With a strut front suspension and a torsion-beam rear, the Fit has a well-damped ride for its size, and does as well as any short-wheelbase car in covering up road imperfections. Honda says it’s retuned the shocks and added more body reinforcement for 2018; we’ll report back if the changes make a vast difference in its benign handling. The first Fit’s delightfully light and quick steering and tightly controlled body motions were traded in on a more compliant ride and less quick and communicative steering in this generation. Honda says it’s beefed up the Fit’s steering rack for better isolation. The Fit dives when braking, although its pedal is precise and easy to mete out. It has big interior space and lots of cargo options, but a busy dash and bargain materials dull the Honda Fit’s finish. The Honda Fit is either blessed or cursed with a small footprint and an inexpensively furnished cabin, depending on how you look at it. What’s immutably true is that Honda does the absolute best job of packaging the Fit, of extracting every cubic centimeter of space and making it more flexible than rivals. The Fit does a better job at moving its seats around and creating space than it does at coddling the people who sit in it. The front seats have thin cushions, and don’t have as much space as those in the second row, a very rare occurrence. The passenger-side footwell is blocked in by a curve that forces legs to the side, a position that will grow tiring during a long trip. The back seat is more comfortable. Tall passengers can pair up back there with very good leg and head room. The tall doors permit graceful entry and exit, too. From there, the Fit’s flexible rear seats and cargo possibilities set it aside from pedestrian economy-car rivals. The Fit’s rear seat is a bench with a bottom cushion that flips up to open up a tall and very useful space right behind the front seats. Dubbed Magic Seat, there’s also a mode in which the front and rear right-side seats fold down to hold a long object like a ladder. The rear seats even have a reclining back rest for road-trip naps. The seatbacks fold down in the usual way, and when they do, the Fit can swallow a bike with both its wheels kept on. Where the Fit concedes again to economy is in cheap carpeting and a thrifty headliner. Road noise hasn’t been objectionable for its class, but Honda has added more padding and sound deadening to the Fit this year. The Honda Fit has a scuff or two on its crash-test scores, but it’s added more safety technology this year. The Honda Fit has a blemish on its crash-test ratings, but perhaps to compensate for it, the hatchback gets some advanced safety additions for the 2018 model year. The NHTSA has given the 2018 Fit a five-star rating overall, with a four-star score for rollover resistance. The IIHS gave the Fit top "Good" scores in most crash tests, but it hasn't subjected the Fit to its finicky small overlap crash test since 2016, when it was rated as "Acceptable." 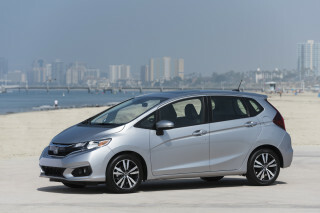 This year, Honda added to the Fit’s array of features such as hill-start assist and rearview camera. A package of safety equipment is now an option on the Fit LX and standard across the rest of the range. It includes adaptive cruise control, forward-collision warnings with automatic emergency braking, lane-departure warnings and active lane control. Fit EX and EX-L hatchbacks also get a right-side-view camera displayed in its infotainment screen that proves useful in tight lanes and parking spaces. Base versions have good equipment, and the Honda Fit can be capped with leather and navigation. The Fit adds a new trim this year. The Sport rises above the base LX, while the EX and EX-L angle for spendy shoppers who like the econobox look. 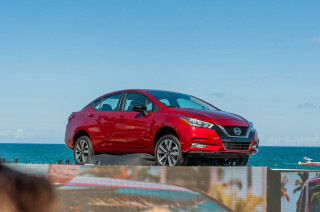 Every Fit comes with power locks and windows, keyless entry, air conditioning, a rearview camera, cruise control, a 5.0-inch touchscreen with an AM/FM audio system, Bluetooth with audio streaming, and a USB port. 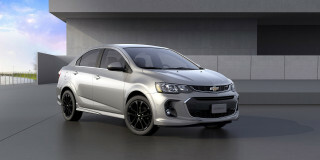 Its base price sits about $1,000 higher than rivals, but not when features are equalized. The Fit Sport gets its own front and rear ends, orange pinstripes, 16-inch black wheels, and an orange-striped black interior. It also has a 7.0-inch touchscreen infotainment system, with Apple CarPlay and Android Auto compatibility. With the Fit EX, Honda adds a right-side-view camera, another USB port, a sunroof, and paddle shift controls when the optional CVT is selected. The EX-L adds heated leather seats and can add navigation. Honda’s latest infotainment and navigation are fuss-free compared to the systems they replaced. The Fit doesn’t offer much in the way of option packages or custom touches. 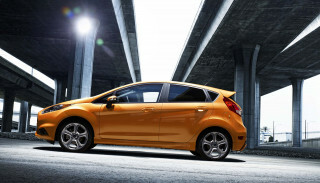 Choose a color—orange is new this year—and a trim level, and move on to the dealer-installed accessories. If great gas mileage is a must, the Honda Fit is a must-drive. The Honda Fit has routinely earned some of the best gas mileage ratings among its competitors, and the latest version is no different. 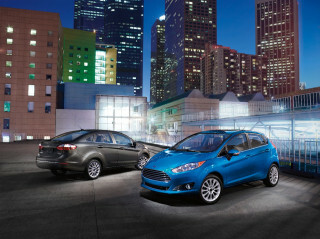 With the base 6-speed manual shifter, the Fit LX and EX and Sport are rated at 29 mpg city, 36 highway, 31 combined. With the CVT, the LX numbers rise to 33/40/36 mpg. Due to extra equipment, the Sport, EX, and EX-L Fit weigh more. That and bigger tires push down its fuel economy a bit, to 31/36/33 mpg.